In 1990 Joel and Ethan Coen were not yet the Oscar-winning, cinephile-worshipped filmmaking legends they are today. They had only written and directed two films: 1984’s inventive neo-noir Blood Simple and 1987’s screwball kidnapping comedy Raising Arizona. Though the brothers had drawn critical acclaim for both, they hadn’t yet proven themselves as the true cinematic chameleons we know them as now. With Miller’s Crossing, an intricate gangster drama that contrasts fedoras and overcoats with the serenity of the forest, the Coens proved they were capable of even more than their brilliant first two efforts suggested. Though it was critically acclaimed, Miller’s Crossing was lost to most audiences in the mire of that year’s other gangster pictures (most notably Martin Scorsese’s Goodfellas, which was released just two weeks ahead of Miller’s Crossing) and as such is one of the lesser-known entries in the Coens’ filmography. In honor of its 25th anniversary, though, we dug up some fascinating facts in the hope of changing that. 1. IT WAS INSPIRED BY A SINGLE CONTRASTING IMAGE. 2. THE COEN BROTHERS TURNED DOWN BATMAN TO MAKE MILLER’S CROSSING. After Raising Arizona’s success established them as more than one-hit indie film wonders, the Coens had some options with regard to what project they could tackle next. Reportedly, their success meant that they were among the filmmakers being considered to make Batman for Warner Bros. Of course, the Coens ultimately decided to go the less commercial route, and Tim Burton ended up telling the story of The Dark Knight on the big screen. 3. IT WAS THE FINAL FILM THE COENS MADE WITH BARRY SONNENFELD. Barry Sonnenfeld became a very sought-after cinematographer throughout the 1980s, in part because of his collaborations with the Coens. Their directorial debut, Blood Simple, was his first feature film as a director of photography, and he went on to shoot both Raising Arizona and Miller’s Crossing for them. The year after Miller’s Crossing was released, Sonnenfeld made his directorial debut with The Addams Family, and went on to direct further hits like Men In Black and Get Shorty. 4. IT WAS THE COENS’ FIRST COLLABORATION WITH STEVE BUSCEMI. Throughout their careers, the Coens have developed a very prestigious company of actors who frequently appear in their films, and Buscemi is among the most prolific. He has appeared in six Coen films, most famously Fargo (1996) and The Big Lebowski (1998). The collaboration started here, when Buscemi was cast as Mink, apparently because he was able to speak faster than anyone else, and fast-talking was crucial to the role. 5. IT WAS ALSO THE COENS’ FIRST FILM WITH JOHN TURTURRO. 6. IT’S ONE OF ONLY THREE COEN FILMS (SO FAR) NOT EDITED BY RODERICK JAYNES. To date, the Coen brothers have written and directed 16 feature films, and 13 of them have been either edited or co-edited by Roderick Jaynes. That level of deep collaboration would make Jaynes the Coens’ most frequent collaborator ever … if he were a real person. Jaynes is actually a pseudonym used when the Coens edit their own movies. 7. ALBERT FINNEY GOT HIS PART BECAUSE OF A SUDDEN DEATH. As Irish mob boss Leo O’Bannon, Albert Finney is at the center of some of the film’s best scenes—and he’s fantastic in them. Sadly, though, he’s only in the film because another actor died tragically before filming began. The Coens originally cast American actor Trey Wilson, whom they’d worked with on Raising Arizona, as Leo. But when Wilson died suddenly from a cerebral hemorrhage at the age of 40, the part went to Finney instead. 8. GABRIEL BYRNE HAD TO CONVINCE THE COENS TO LET HIM KEEP HIS IRISH ACCENT. 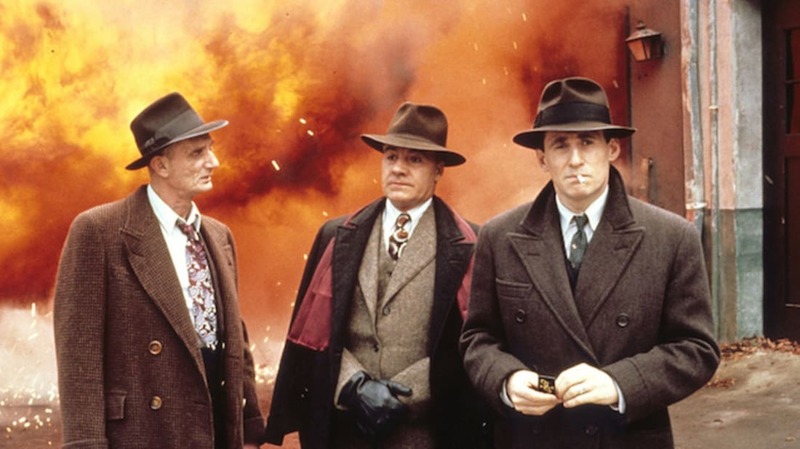 Though he was an Irish native playing a lieutenant to an Irish mobster, the Coens did not originally want Gabriel Byrne to use his own accent in the film. Byrne argued that his dialogue was structured in such a way that it was a good fit for his accent, and after he tried it, the Coens agreed. Ultimately, both Byrne and Finney used Irish accents in the film. 9. PETER STORMARE WAS SUPPOSED TO PLAY A MOB ENFORCER IN THE FILM. The Coens’ original plan for Miller’s Crossing involved Peter Stormare playing a character called “The Swede,” who would be the trusted enforcer of Italian mob boss Johnny Caspar (Jon Polito). A commitment to a theatrical production in Sweden meant that Stormare had to turn down the role, though, so the part was rewritten as “The Dane” and played by J.E. Freeman. Stormare ultimately got to work with the Coens six years later on Fargo, and again two years after that on The Big Lebowski. 10. MARCIA GAY HARDEN HAD SOME STIFF COMPETITION FOR HER ROLE. As Verna Bernbaum, whose relationships with both Leo and Tom ignite some of the film’s key tensions, Marcia Gay Harden delivered one of the best performances of her career, but it wasn’t an easy role to get. She reportedly competed for the role with the likes of Julia Roberts, Demi Moore, and Jennifer Jason Leigh. 11. JON POLITO HAD TO CONVINCE THE COENS TO CAST HIM IN A DIFFERENT ROLE. When Polito read the Miller’s Crossing script, he loved it and immediately wanted to audition for the role of Johnny Caspar. The Coens had different ideas, and were considering the 39-year-old actor for the role of Caspar’s enforcer, Eddie Dane, instead. The role of Caspar was originally supposed to go to an actor in his mid-50s, but Polito was adamant. The Coens ultimately gave in, and Polito was cast. They must have liked what they saw, too, because they ended up casting him in four more films after that. 12. A SNAG IN THE SCRIPT ULTIMATELY LED TO BARTON FINK. Miller’s Crossing is a complicated beast, full of characters double-crossing each other and scheming for mob supremacy. In fact, it’s so complicated that at one point during the writing process the Coens had to take a break. It turned out to be a productive one: While Miller’s Crossing was on pause, the brothers wrote the screenplay for Barton Fink, the story of a writer who can’t finish a script. 13. THE FILM FEATURES MULTIPLE CAMEOS FROM REGULAR COEN COLLABORATORS.